Sarah J's01493 722022work Shop - Hair & BeautySarah J's in the village of Caister-on-Sea near Great Yarmouth is a unisex salon catering for all your hair and beauty needs. 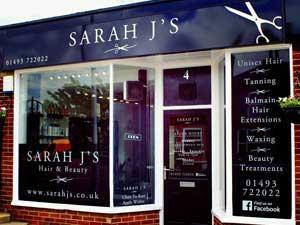 Sarah J's in the village of Caister-on-Sea near Great Yarmouth is a unisex salon catering for all your hair and beauty needs. Five cutting stations, a beauty room, spa, a separate tanning room for vertical tanning with a Pay-As-You-Go option available for over-18s only, and a nail bar – it all makes for a well-equipped salon offering a wide range of treatments, including waxing, pedicures,spray tans and the all “NEW” Microdermabrasion painless skin treatment. On arrival in Great Yarmouth follow signs for the A149 to Caister-on-Sea, proceeding past Yarmouth Stadium and over the roundabout towards the village. Sarah J's is located in the centre of the village just past the mini roundabout.